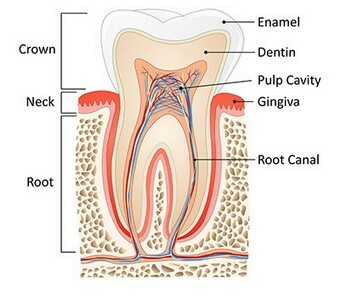 Endodontists are dentists who specialize in maintaining teeth through root canal treatments. Dr. Karmali has the specialized training and experience to give you a painless and predictable outcome. That's why you have been referred to Lowry Endodontics. In addition to four years of dental school, Dr. Karmali received three more years of advanced education. He studied the latest proven root canal techniques and procedures in great depth. This makes him very experienced in the diagnosis and treatment of more difficult cases. For this reason, many dentists choose to refer their patients to Dr. Karmali for their endodontic needs. Our priority is to make your root canal treatment painless. If you are nervous, we can give you medication to reduce your anxiety. The inside of the tooth will be meticulously cleaned, disinfected and sealed. The number of visits are customized to give you a predictable and pain free experience. To Dr. Karmali, it's more important to do the root canal treatment carefully instead of quickly. Dr. Karmali's careful approach has earned him the reputation of saving teeth that otherwise would have required extraction. Oral and facial pain can be difficult to diagnose. Dr. Karmali is a specialist in diagnosing and treating this type of pain. Prior to every treatment, Dr. Karmali performs a comprehensive examination to ensure that root canal treatment is your best option. Often times, he is able to find a more conservative treatment option. In fact, he is asked to lecture around the country on his conservative diagnostic approach. A lot of Dr. Karmali's practice is retreating root canals that are not working. When done carefully, he can often save you from extraction and expensive replacement. Retreatment starts with a comprehensive evaluation. Root canal retreatment can then be customized to give you a very high success rate.